A question for our veterans...I purchased this sign on eBay. It appears original...but I would like to see if you can confirm or otherwise enlighten me as to that issue and then it’s value considering the top left corner cut. It measures 7.75 inches wide by 7 and 5/8th inches tall. It has 2 of the 3 grommets and is otherwise in good shape. Any help would be greatly appreciated. Thanks! Last edited by Stephenwarren30; Sat Sep 08 2018 04:38 PM. Yes, it's an original. I looked at it a couple times, thought the BIN or best offer was fair considering the damage. Hell, I'd rather put $100 in a damaged original than pay what these yahoos are for the fake "IR47" dated junkers that flooded the market in the last year. Does anyone know what years Mobil used these signs? I really appreciate your input. I was trying to date the sign. Do you know when these were used? The Mobil Collectors guide dates the signs from 47 to 62. I've just always generically dated them to the 50's myself. Darrin...I really appreciate all your help. 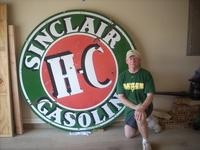 I have a 50+ inch Mobilgas Sign that also has the top and bottom left side missing. I mounted it on plywood and painted the wood to match the sign. I will do the same for the little guy! Last edited by Stephenwarren30; Sun Sep 09 2018 07:45 AM.